But I have got inspired by Allan at digitalDrummer who has written a couple of posts of going to Windows 8 versus W7. So – I started to wonder…why not upgrade one system to Windows 8 and see what’s happen. So I did! I have two similar systems which I use for generic music tasks like Cubase, VSTs and one system especially target for live drumming using Addictive Drums, MegaDRUM etc. I selected my live drum system as the W8 victim for my tests! They are both equal and the model is a HP Compaq 6910p system with 2GHz, Intel Dual Core, 3GB, 200 GB hard disk and an external USB based 8 channel DSP based soundcard from M-Audio called Fast Track Ultra 8R(Driver 1.5.1 for W7). So these systems are real old!! On the current selected system, I had Windows 7 SP1 running in 64 bit mode. I was also running the application VST Host(1.53) in 64 bit mode which hosted Addicted Drums 1.5.4 in 64 bit mode. Connected to the system I used the MegaDRUM USB midi trigger device (Firmware 20121216) and the related MegaDRUM Manager(20121202) + Oracle Java 7 Version 10. Windows 8 Pro, same hardware except for the hard disk which now was a 120 GB SSD disk. To test the soundcard latency I used a common used tool from Centrance called LTU. The LTU measures the audio delay in your Windows™ computer. 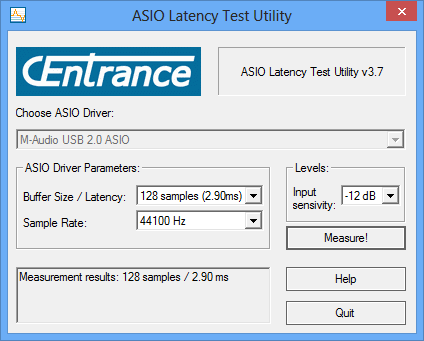 Determines true round-trip latency of your computer audio setup, from input to output, via an ASIO driver. (You actually connect the sound cards output to the input…see http://centrance.com/products/ for more information. Loading the W8 OS. I created a bootable USB stick and booted from that. I wanted to create a clean installation on my system. Creating a bootable USB stick – my recommendation to use the Windows 7 USB/DVD download tool from Microsoft Store. This application can create a bootable USB stick from a Microsoft Operating ISO file. W7/W8 etc. Boot your system that you are going to install/upgrade on the W8 USB stick. Proceed with installation sequence. I did reformat my hard disk etc. Ready!! – Wait for the Windows Update to run do all patching first. A antivirus malware application is included directly from MS called Security Essentials. Attach all your hardware – normally – W8 will find the requested hardware drivers. In my case I needed to download the M-Audio/AVID driver to install. This was a W7 driver…but it works for W8 without any problems. The MegaDRUM Device use the Windows Core USB midi driver. Included in W8 – Just to run! Fine!! Just to install the VST Host for X64 and then also install Addictive DRUMs which now has a very fine online installer!! For MegaDRUM Manager – Oracle Java 7 is required. Needs to be installed in desktop mode. Comparisons between the old and new system. Note: Based on the extreme performance boost showed in Windows 8 – I decided to reinstall the system again but now with Windows 7 and a SSD disk. (Just to see if the SSD disk was the thing boosting the performance) So I did. But when meassuring the latency again on this system I got a result on 10.50 ms in Windows 7. So my conclusion is that Windows 8 is faster!! Okej – Have I done any tweaks on Windows 7 or Windows 8 on the figures above like switching off certain services etc? NO!! I have not spent a minute to tweak them. W8 is fast as hell!! To boot and to work with. The ASIO performance was worth the whole journey!! On my old system I gained like 3 times in performance boost!! You could always question the absence on the start button…but now your start button has been spread over the whole screen instead…I can live with this. (If you can’t live with this – there are solutions for this also like the Start8) Still missing the hided power off button? There are solutions for this also!! Nice to see my critical applications like Addictive Drums, MegaDRUM Manager and VST Hosts were working in Windows 8 without any problem. (Even sleep/resume works with these apps running) Of course – they have to run in the old desktop mode…but what the heck – It works and performs well! Finally, I think I need to go out and find a Intel i7 core based system with touch…that would be a nice live drum system!! 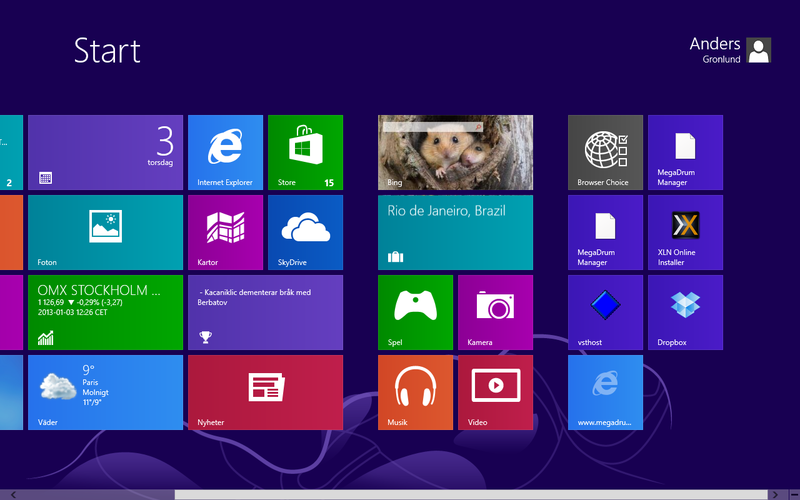 Microsoft Windows 8 – My best recommendations! I have a top line interface – antelope zen studio, windows i7 with 32GB ram and a samsung NVME ssd, so thought that I would probably have a pretty zippy experience, but it is unplayable. I have played with the buffer sizes in superior drummer and within my audio interface to no effect, so I suspect this a problem intrinsic to superior drummer on my system. Any ideas? What kind of drivers are you using with your sound card. Asioall or a real native driver?